I have to say that I was impressed how much forest science (I learnt that there is an important difference between “Forestry” and “Forest science”) has broadened toward a “landscape approach”. Rather than focusing on forestry alone, a guiding theme of the conference were linkages to other biomes and land-use sectors, whether to farmlands (agroforestry), urban areas (urban forestry), or the sea (coastal and mangrove forests). Biodiversity and multiple ecosystem services are now accepted as important management goals, rather than timber production alone. The well-being of people (e.g., health, livelihoods, employment) living in or from forests was a common thread through many presentations. Historical trajectories, cultural values (my favorite session title: “Wood and forest culture”), governance, and ethical implications of forests were covered prominently as well. What has forest science won by adopting a “landscape approach”? It has certainly strengthened its political relevance, as highlighted in a video-keynote delivered by His Royal Highness The Prince of Wales. It allowed the discipline to modernize by becoming one branch of “sustainability sciences”, integrating new methods and approaches and opening up a much broader portfolio of potential jobs for forest scientists (most of them nowadays work outside the forest service). At what cost? Maybe forest science experienced a loss of identity, as the progressive disappearance of the word “Forestry” from many department names indicates. (For example, my university department was recently renamed from “Forest and Landscape” to “Geosciences and Natural Resource Management”.) However, the concept of resilience teaches us that we need to embrace change, if we want to retain identity. What challenges are still ahead? Awareness for environmental justice (questions of gender, race, power, wealth etc.) is not yet much developed in the forest sciences, as highlighted by keynote speaker Carol Colfer. For example, she pointed out that “old, white men” are still dominant among the IUFRO prize winners, neglecting the diversity of forest researchers. I feel another problem is that “landscape thinking” has mostly gained ground in international forest science, but is still largely missing in practical forest management. Also, there is still a strong “conventional” branch of forestry, as a quick look into various (especially national-level) forest research journals shows. 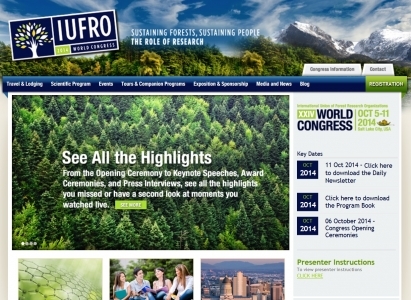 Read more about IUFRO World Forest Congress by visiting their website.